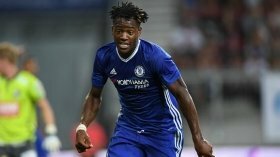 Belgium international Michy Batshuayi has reportedly agreed terms with Crystal Palace ahead of his deadline-day loan move from Chelsea. The 25-year-old recently returned from an unsuccessful loan stint with Valencia and he has since been put up in the transfer market with Maurizio Sarri not said to favour his services. The Blues were initially hoping to sanction the striker's permanent sale for around £35m this month but with the failure to receive concrete offers, they seem to have eventually settled for a temporary sale. According to Sky Sports News, the Eagles have agreed on personal terms with the experienced marksman and the temporary move is expected to progress on deadline day. Palace have struggled upfront with Jordan Ayew struggling to impress in the injury absence of Christian Benteke but Batshuayi should sort the concern, given he has generally possessed an impressive record leading the line. The former Marseille endured a difficult spell with Valencia with just three goals from 23 appearances. Prior to that, however, he was impressive at Borussia Dortmund on loan where he scored nine times in 14 games.